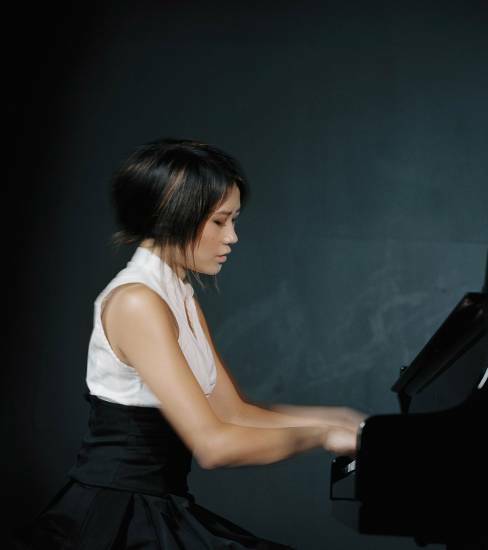 The 2011 Tanglewood schedule for Week 5, August 5 – 11 includes Rafael Frühbeck de Burgos conducting a BSO program featuring the young Chinese pianist Yuja Wang, who makes her Tanglewood debut in Rachmaninoff’s Rhapsody on a Theme of Paganini; Emanuel Ax performing Mozart’s Piano Concerto No. 22 in E-flat, K.482; the Festival of Contemporary Music continues; California rock band Train makes its Tanglewood debut; and Stephanie Blythe visits Ozawa Hall for a concert of American music including aaron Copland’s In the Beginning. Spanish conductor and frequent Tanglewood guest conductor Rafael Frühbeck de Burgos takes the podium on Friday, August 5 for a BSO program featuring the young Chinese pianist Yuja Wang, who makes her Tanglewood debut in Rachmaninoff’s perennial audience favorite Rhapsody on a Theme of Paganini. Also on the program are Beethoven’s boisterous Symphony No. 8 and Strauss’s Suite from Der Rosenkavalier. On Saturday, August 6, renowned violinist Sarah Chang joins the orchestra for Mendelssohn’s sparkling Violin Concerto on a program that also includes Rachmaninoff’s Symphony No. 2 and American composer Pierre Jalbert’s Music of air and fire. Sean Newhouse, one of the BSO’s new Assistant Conductors, will lead the orchestra for the first time. The BSO’s fifth weekend comes to a close Sunday, August 7 with one of the world’s foremost concert pianists, Emanuel Ax, performing Mozart’s Piano Concerto No. 22 in E-flat, K.482. Lionel Bringuier, an Assistant Conductor of the Los Angeles Philharmonic Orchestra making his BSO and Tanglewood debuts, also will conduct Tchaikovsky’s Symphony No. 5 and Smetana’s The Moldau, the composer’s most famous music from his iconic work of musical nationalism, Má Vlast. Also on August 7 is the orchestral culmination of the Festival of Contemporary Music with a program that features Felipe Lara’s Onda, Jo Kondo’s In Summer, David Felder’s Inner Sky, and Andrew Norman’s drip blip sparkle spin glint glide glow float flop chop pop shatter splash. Monday, August 8 brings another rock concert to Tanglewood as Train, known around the world for hits such as “Hey, Soul Sister,” take the stage in the Shed. On Tuesday, August 9, the Boston Symphony Chamber Players reprise the majority of their October 17 Boston concert and are joined by composer-conductor-pianist André Previn in music that includes Previn’s effervescent new Octet for Eleven, for winds, brass, and strings, a work commissioned by the BSO. Opera superstar mezzo-soprano Stephanie Blythe visits Ozawa Hall Wednesday, August 10, joining TMC faculty members Alan Smith, violinist Andrew Jennings, cellist Norman Fischer, as well as the Tanglewood Festival Chorus, John Oliver, conductor, for a concert of American music including Copland’s In the Beginning, Mr. Smith’s Vignettes: Covered Wagon Woman and An Unknown Sphere (a world premiere and BSO commission), and selected African American spirituals.